- Ellie reached all of her normal milestones up until 9 months of age. - She rolled, got herself into a sitting position, crawled, stood and took steps around a table and also with her toy walker. - And she could walk 4 passes on the monkey bars. - Ellie could not crawl. She was unable to even rollover. If we placed her on all 4’s she did not have the muscle strength to hold her position without collapsing. - She could not pick up her foot to take a step. The doctors told us our beautiful daughter is not expected to ever take a step again in her life. - She then lost the ability to even reach her hand up to her mouth. - And she became so floppy that picking her up under her arms became very difficult. 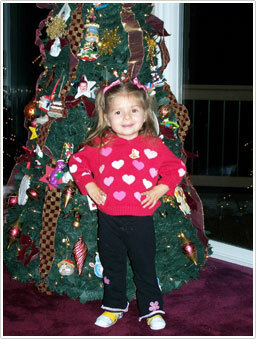 - Ellie symptoms instead of getting worse, she began to regain muscle strength and get better. 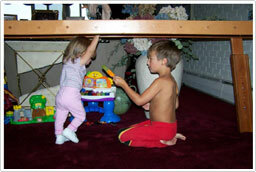 - Now for the first time since she became ill, she was able to pick up her legs and walk 4 feet holding on to a table. - She was much less floppy under the arms and easier to pick up. - Ellie can walk a number of steps with her toy walker now. - She can reach over her head. - She walks 6 rungs on the monkey bars. - Ellie walked over 30 feet with her toy walker. - And she also can walk 30’ by only hanging on to someone’s fingers. - She can walk 100’ while just hanging on to someone’s fingers. We were told that our child would never be able to walk again, that she would continually get worse and that their was nothing known that could stop her deadly decline. We can never thank you enough for proving them wrong. Thanks to you very much!